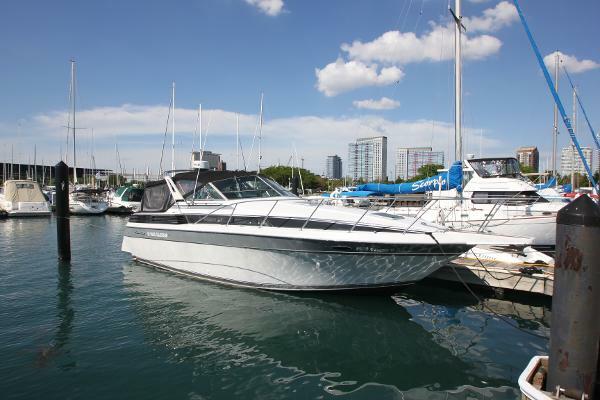 1987 Chris-Craft 320 Amerosport Nice clean boat with the Twin 220 HP Crusaders with 480 hours. Has Air Condition w/Heat, 6.5kw Generator, GPS, VHF Radio, Depth Finder, 4 New Fenders, Refrigerator, Hot Water, Microwave, Electric Stove, Bimini Top, 4 Rod Holders, Searchlight, Shower, Trim Tabs, Central Vac, Alarm System, Invertor and MORE! 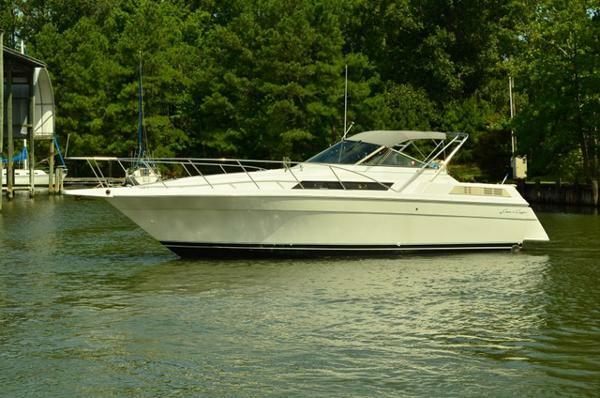 1987 Chris-Craft 320 Amerosport Come check out this very clean recently updated Chris Craft Amerosport. With her wide beam and spacious cockpit it makes this boat very attractive for day boaters. She has an extended swim platform with a ladder, and a brand new Simrad Graph/Gps/Auto Pilot unit. New Marine Air AC installed at the end of 2015 and a brand new re upholstered and carpeted salon. Other options that are included are a standard horizon depth finder along with VHF radio, a Ritchie compass Norcold fridge and a newly installed Tecma head(2015). This vessel has passed all coast guard regulations and safety inspections prior to be launched for the 2016 boating season. Fire extinguishers are all up to date and certified. Call now to schedule a viewing of this very clean vessel before it is to late! 1990 Chris Craft1 320 Amerosport Express This is a one owner extra clean and affordable express cruiser that is priced aggressively to move fast. Her extremely knowledgeable owner has maintained this boat professionally and with a completely open check book since day one.She is kept under cover and her gel coat still shines just like the day that she was first commissioned.Powered by the much sought after 7.4L 454’s that produces 350hp with only 850 original hours. Her owner has full records to support her meticulous mechanical care.You will be hard pressed to find a mid-size express cruiser that presents itself any better than this one does. The most discriminating buyer would be very impressed in every respect.Call today to arrange a personal showing to see her in person for yourself. REPO! 1987 Chris Craft 32 Amerosport. Always FRESHWATER!! REPO SALE 1987 Chris Craft 320 Amerosport 32’ Twin Engine Express Cruiser Twin Crusader/5.7/270HP/V-8 Inboards This is an auction for a REPO BOAT. This boat was seized for back storage owed. BEST OFFER BUYS THIS BOAT!! Do not bid on this boat unless you intend to follow through with the sale. Please ask all questions prior to bidding. If you need to see the boat, do so before bidding. Thank you. This boat is in good condition, and needs nothing to enjoy today! This has always been a Great Lakes freshwater boat. The engines are in good running condition, with 891 original hours, and can be driven anywhere. It would make a great family cruiser or big water fishing boat owing to the large aft deck with fold away seats. This boat would benefit from a polish and wax to make her look her best. Structurally, she is very good condition, with no signs of damage or abuse. There are no major scratches, nor are there any repairs. The decks are very solid, and the bottom has anti-fouling paint. The soft goods are in nice condition. The cabin upholstery and carpet is in good shape and clean. There are sleeping accommodations for 6 adults, 2 in the private V-berth, 2 on convertible dinette, and 2 on sofa/bunk beds. The galley is nice, with AC/DC refrigerator and 2 burner electric/alcohol range and microwave oven. The head has an electric marine toilet and shower. The canvas consists of convertible top, side and aft curtains. They are fair, serviceable condition, but due to be replaced soon. The cockpit seating is in good condition with only a few minor blemishes. The boat is in the water and in good running order. See the recent videos from October 20, 2014 of the boat under way! VALUE: Many of these boats sell for $15,000.00 to $20,000.00 on the internet and open market. 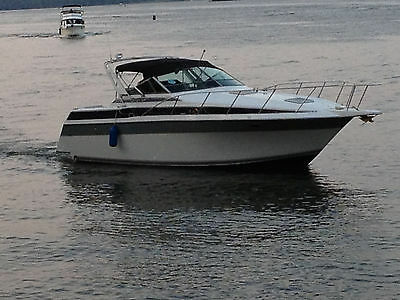 This boat will sell for much less… Someone is going to get a GREAT DEAL!!! This boat and title are free of all liens and encumbrances. 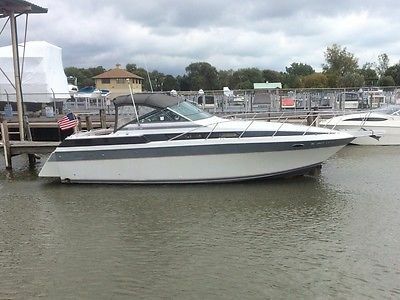 REPO SALE 1987 Chris Craft 320 Amerosport 32’ Twin Engine Express Cruiser Twin Crusader/5.7/270HP/V-8 Inboards Hull I.D.# CCHEX047A787 This boat is located at our facility in Harrison Township, Michigan, and must be sold. Please view videos of boat running in water FEATURES AND EQUIPMENT: Sleeping for 6 V-berthConvertible sofa/bunk bedsConvertible dining tablePrivate enclosed headGalley sink2 burner alcohol/electric cooktopAC/DC RefrigeratorHot water heaterAnchorSwim platformSwim ladder30 amp/120V Shore powerBattery chargerDual batteriesShore water inletBlowerAuto bilge pump Full instrumentation Engine SynchronizerTrim tabsCompass VHFDepthSpeed, Distance LogNavigation lightsStainless steel HornsAM/FM/CD stereo LOA: 31’ 11” BEAM: 11’ 11” Engines: Powered by Twin Crusader/5.7/270HP/ V-8 Inboards with V-drives Hours: 891 Weight: 12,000LBS Fuel: (GAS): 200 Gallons Water: 50 Gallons Trailer: NONE. NO TRAILER INCLUDED IN SALE Yard Storage Fee: Paid until December 15th, 2014. After this date there will be a $10/day storage charge. Please Note: The Marina charges $10/foot to load boats onto trailers or trucks. This fee can be paid at time of pickup. We do not ship or haul boats. Contact a marine hauler or company such as U-Ship for a shipping quote. We can also provide contact info for local companies and international shippers. Location of vessel: (Harrison Township, Michigan 48045) Send checks to: Hideaway Yacht Sales 36290 Jefferson Ave. Harrison Township, MI 48045 If you have any questions please e-mail or call: JOHN: 248-765-5610 Make all checks payable to Hideaway Yacht Sales A 10% NON-REFUNDABLE hold deposit is required within 48 hours after auction closes. Please use FedEx overnight or an equivalent overnight shipper. PayPal may also be used for deposit only. If the deposit is not posted the next day, the boat will be sold to the next person in line at our discretion. Final amount due no later than 10 days after auction closes. Certified Check or cash for final payment. Vessel will not be released until funds have cleared. Vessel is free and clear of all liens and encumbrances. Vessel sold as is-where is, no warranty. All Michigan buyers must pay 6% Michigan Sales tax and all registration and transfer fees unless registered as Michigan watercraft dealer. All buyers must abide by the laws of the State of Michigan in regards to sales and use taxes. This vessel is for sale locally. We reserve the right to end this auction early. The Company offers the details of this vessel in good faith but cannot guarantee or warrant the accuracy of this information nor warrant the condition of the vessel. A buyer should instruct his agents, or his surveyors, to investigate such details as the buyer desires validated. This vessel is offered subject to prior sale, price change, or withdrawal without notice. REPO SALE 1987 Chris Craft 320 Amerosport 32’ Twin Engine Express Cruiser Twin Crusader/5.7/270HP/V-8 Inboards This is an auction for a REPO BOAT. This boat was seized for back storage owed. BEST OFFER BUYS THIS BOAT!! Do not bid on this boat unless you intend to follow through with the sale. Please ask all questions prior to bidding. If you need to see the boat, do so before bidding. Thank you. This boat is in good condition, and needs nothing to enjoy today! This has always been a Great Lakes freshwater boat. The engines are in good running condition, with 891 original hours, and can be driven anywhere. It would make a great family cruiser or big water fishing boat owing to the large aft deck with fold away seats. This boat would benefit from a polish and wax to make her look her best. Structurally, she is very good condition, with no signs of damage or abuse. There are no major scratches, nor are there any repairs. The decks are very solid, and the bottom has anti-fouling paint. The soft goods are in nice condition. The cabin upholstery and carpet is in good shape and clean. There are sleeping accommodations for 6 adults, 2 in the private V-berth, 2 on convertible dinette, and 2 on sofa/bunk beds. The galley is nice, with AC/DC refrigerator and 2 burner electric/alcohol range and microwave oven. The head has an electric marine toilet and shower. The canvas consists of convertible top, side and aft curtains. They are fair, serviceable condition, but due to be replaced soon. The cockpit seating is in good condition with only a few minor blemishes. The boat is in the water and in good running order. See the recent videos from October 20, 2014 of the boat under way! VALUE: Many of these boats sell for $15,000.00 to $20,000.00 on the internet and open market. 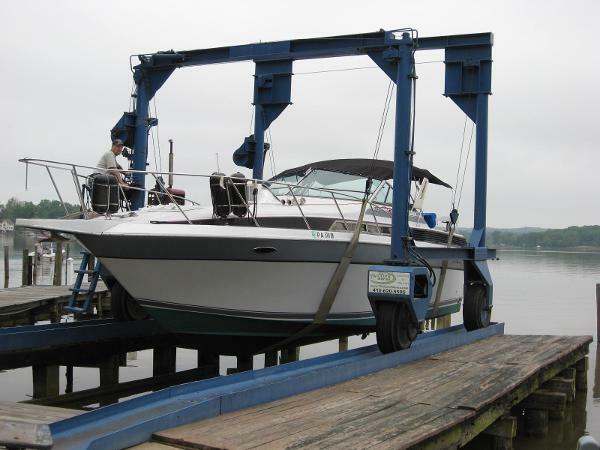 This boat will sell for much less… Someone is going to get a GREAT DEAL!!! This boat and title are free of all liens and encumbrances. 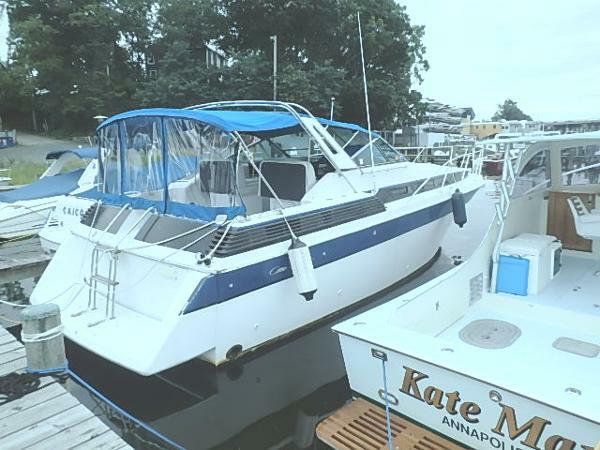 REPO SALE 1987 Chris Craft 320 Amerosport 32’ Twin Engine Express Cruiser Twin Crusader/5.7/270HP/V-8 Inboards Hull I.D.# CCHEX047A787 This boat is located at our facility in Harrison Township, Michigan, and must be sold. Please view videos of boat running in water FEATURES AND EQUIPMENT: Sleeping for 6 V-berthConvertible sofa/bunk bedsConvertible dining tablePrivate enclosed headGalley sink2 burner alcohol/electric cooktopAC/DC RefrigeratorHot water heaterAnchorSwim platformSwim ladder30 amp/120V Shore powerBattery chargerDual batteriesShore water inletBlowerAuto bilge pump Full instrumentation Engine SynchronizerTrim tabsCompass VHFDepthSpeed, Distance LogNavigation lightsStainless steel HornsAM/FM/CD stereo LOA: 31’ 11” BEAM: 11’ 11” Engines: Powered by Twin Crusader/5.7/270HP/ V-8 Inboards with V-drives Hours: 891 Weight: 12,000LBS Fuel: (GAS): 200 Gallons Water: 50 Gallons Trailer: NONE. NO TRAILER INCLUDED IN SALE Yard Storage Fee: Paid until November 15th, 2014. After this date there will be a $10/day storage charge. Please Note: The Marina charges $10/foot to load boats onto trailers or trucks. This fee can be paid at time of pickup. We do not ship or haul boats. Contact a marine hauler or company such as U-Ship for a shipping quote. We can also provide contact info for local companies and international shippers. Location of vessel: (Harrison Township, Michigan 48045) Send checks to: Hideaway Yacht Sales 36290 Jefferson Ave. Harrison Township, MI 48045 If you have any questions please e-mail or call: JOHN: 248-765-5610 Make all checks payable to Hideaway Yacht Sales A 10% NON-REFUNDABLE hold deposit is required within 48 hours after auction closes. Please use FedEx overnight or an equivalent overnight shipper. PayPal may also be used for deposit only. If the deposit is not posted the next day, the boat will be sold to the next person in line at our discretion. Final amount due no later than 10 days after auction closes. Certified Check or cash for final payment. Vessel will not be released until funds have cleared. Vessel is free and clear of all liens and encumbrances. Vessel sold as is-where is, no warranty. All Michigan buyers must pay 6% Michigan Sales tax and all registration and transfer fees unless registered as Michigan watercraft dealer. All buyers must abide by the laws of the State of Michigan in regards to sales and use taxes. This vessel is for sale locally. We reserve the right to end this auction early. The Company offers the details of this vessel in good faith but cannot guarantee or warrant the accuracy of this information nor warrant the condition of the vessel. A buyer should instruct his agents, or his surveyors, to investigate such details as the buyer desires validated. This vessel is offered subject to prior sale, price change, or withdrawal without notice.